We just had a new business meeting for a lifestyle brand where we discussed the “borrowed interest” of a non-surfing consumer who supports surf brands. Why would a non-surfing customer want to shop from a surf brand if they don’t actually play the sport? Because of what the culture of that sport represents. When you work to define the concepts behind a lifestyle brand, it’s more important to hone in on the attitude, values, and culture of your brand than it is to champion the life you live or don’t live. I don’t go to Mexico nearly enough to be an authentic supporter of the “CaliBaja” lifestyle brand, but I do believe in the message and values of the brand. I wear the sweatshirt as a representation of that belief. I don’t “Live a Great Story” as much as I did in my 20s, but the suggestion to always check in with your story, and get out there to do something that fills it in colorfully is definitely a mentality I appreciate. Supporting and following them reminds me to live life to the fullest, however that looks for me now as a business owner and mom of two. If I fractured my body in some debilitating way that left me unable to surf, if I had some terrifying fear of the ocean, or if I just never had an ocean-loving family and good friends to introduce me to the sport, I’d likely still buy into it. In fact, many of my good friends are “surfers” who don’t actually surf. They’re not posers as they never say they are surfers, but they exude the lifestyle, the spirit, and the attitude – hence our friendship. 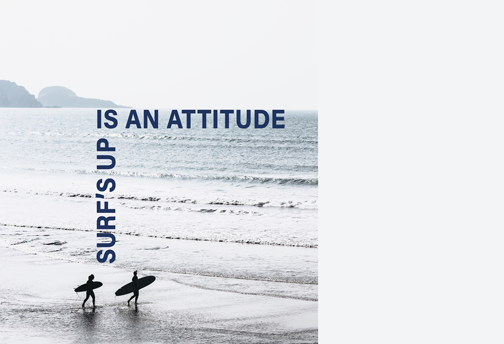 You don’t have to be a surfer to work at Four Fin, but you have to have the right attitude. Positive vibes, grounded spirits, challenge-seeking thirsts, and a passion for clean lines. In fact, the surfer attitude is something we talk about a lot here at Four Fin. We even wrote a blog series on how branding is like surfing. Need some convincing? Read for yourself.